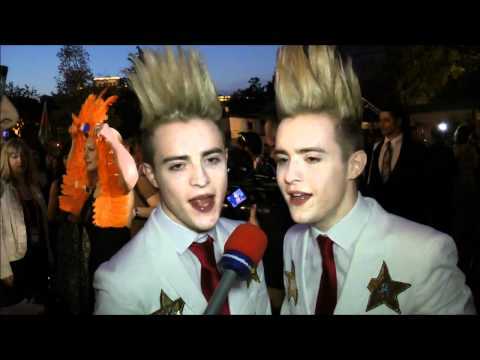 Last year the Irish public and juries have determined to send the crazy boy duo Jedward to the ESC in Düsseldorf. First of all the Irish have been shocked but later they were proud. The sibling brothers with the striking hair style captured the votes of the European viewers by a storm, directly qualified for the final and made a well earned and respectable 8th rank. This year Ireland has picked the duo for another time in the Late Late Show on RTE. The competition consisted of five entries with more or less good entries. But it was clear from the very first minute that Jedward will make it again, the others were chanceless. Jedward’s mentor was the former ESC winner Linda Martin, who picked the song and the singers. Obviously Jedward had a splendid time in Düsseldorf, with rehearsals, parties, interviews and press conferences. The song “Waterline” is even better, more melodic and catchier than “Lipstick”. It’s a real pop tune with potential; the stage show in the national final was quite similar to the ESC performance 2011. For Baku a new choreography would help a lot for a better position. The big question is: will Europe bear this duo for a second time? For 46th time Ireland is participating in the Eurovision Song Contest this year. Ireland is the most successful countries in the ESC with seven victories since 1970. The absolute record could be achieved in the 90’s when Ireland won three times after another, and when Norway won in 1995, Ireland could win another time after that in 1996. The winning songs were: “All Kinds Of Everything” by Dana in 1970, “What's Another Year” by Johnny Logan in 1980, “Hold Me Now” by Johnny Logan in 1987, “Why Me” by Linda Martin in 1992, “In Your Eyes” by Niamh Kavanagh in 1993, “Rock 'n' Roll Kids” by Paul Harrington and Charlie McGettigan in 1994 and “The voice” by Eimear Quinn in 1996. The other Irish record is named Johnny Logan; he won the ESC twice as a singer and once as a composer. On the top of that there were quite good rankings, four second places one third and many more top 10 places. Since the semi finals have been introduced, Ireland didn’t make it three times into the grand final. It also shows that traditional ballads and pop from Ireland has the highest chance to qualify.